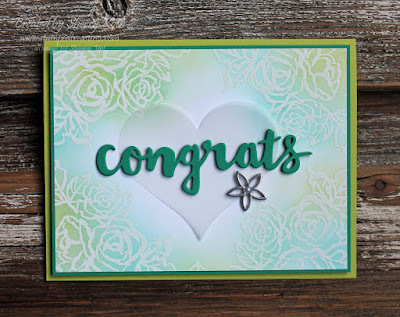 When was the last time you created a card using a technique? I don't do techniques very often but, sometimes I'll go on a technique spurt where I'll try several new ones, and revisit some older techniques. The last couple months I've been doing a bit of both. Stamp desired image with VersaMark onto glossy or whisper white cardstock. This image is from an upcoming stamp set called Petal Palette (available Jan. 3). Note: for this card I only stamped the image around the edges, leaving the center blank. Sprinkle with white embossing powder, tap off excess and heat set. Using a sponge, add ink all over and around stamped images. I used a combination of emerald envy and lemon lime twist inks. I love this color combination. Take a tissue and wipe off the excess ink from the embossed areas. This step will make the images pop. It looks amazing in person. To decorate the rest of the card, I add a vellum heart to the center and then stacked a couple of the words congrats and added them over top. The embellishment is from the Petal Passion embellishments pack (available Jan. 3). Wouldn't this make a great wedding card?